Clearing the Nightstand – my books. my life. (This post was originally entitled “Clearing the Bedside Table but Ben makes fun of me when I use that word. Or bureau instead of dresser. Or carriage instead of shopping cart. The list goes on. I blame the confusion on growing up in Michigan while living with parents who speak with heavy Boston accents and seem to invent their own words). I finished Kavalier and Clay. I wasn’t entirely sure that the day would ever come. As you can see from my previous post, I was determined to do this by May 1. Well, I woke up yesterday morning and decided to do it that day. I calculated that I basically had to read 20 pages an hour for 12 hours to finish. So all I did yesterday was read. Some of it was by the pool and I did manage to do some laundry, too. But basically I read. And it wasn’t hard. I was so into the book that I wanted to keep reading. It really is a fantastic book and you all should read it if you haven’t done so. Just make sure that you are ready for it when you do. Finish Buffy Season 8 (Part 1). This is first on the list because it’s due back to the library soon. Finish MacBeth (Ben is teaching it right now and I figured I’d read along this time. We read it out loud and it’s kind of fun). Finish Northanger Abbey (my last Austen). Continue reading An Intellectual Devotional – I kind of forgot about it for a few months. 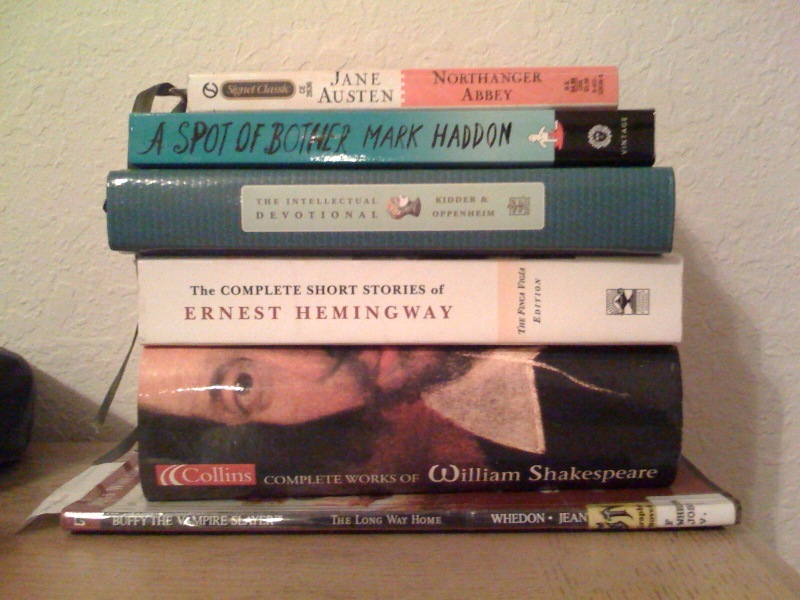 And I will likely do nothing with the Hemingway short stories except occcasionally read one. It’s sort of a permanent part of my nightstand now. It’s been sitting on it since the spring of 2004. That means it has followed me on multiple moves and survived mass cleanings. It’s been there longer than Ben. I was in college when it first sat upon that spot. It feels a shame to move it now. Occasionally it sits in the drawer but that’s the farthest it ever roams. I thought I heard that they were making it into a movie soon but it looks like they've put it on hold.